Two days after the much-watched and talked about Republican debate on CNN Wednesday, results of a new Rasmussen poll released Friday placed Ben Carson and Donald Trump in a statistical tie when Republican voters were asked who they think will win the Republican nomination for president. The national telephone survey of 1,000 likely Republican voters conducted Sept. 16-17 shows that 59 percent of them now think Carson, a retired neurosurgeon, is likely to win the Republican nomination come next year compared to 58 percent of GOP voters who think celebrity billionaire Trump is likely to be the party's nominee. Since respondents were asked separately for each candidate, the percentages do not have to add to 100. Some 23 percent of voters answered that Trump is "very likely" to be the GOP presidential nominee compared to 16 percent who think the same for Carson. A CNN/ORC poll released Sunday shows that on the question of who likely Republican voters will vote for, Trump is still in the lead, but former Hewlett Packard CEO Carly Fiorina is now in second place followed by Carson in third. This means that the three candidates with no political experience are currently leading all the other candidates. Reacting to the success of both Carson and Trump at the polls and why their message seems to be resonating with the public at this point in the presidential race, Geoff Colvin, longtime editor and columnist at Fortune magazine, noted in a Thursday op-ed that it is "authenticity." "A conundrum of this race, and a lesson for leaders everywhere, is that the two most successful candidates so far are the loudest one and the quietest one. That fact tells us a few things: There is no superior leadership style or any definable leadership personality. Style and personality are not what make a leader," wrote Colvin. "Authenticity always comes through. 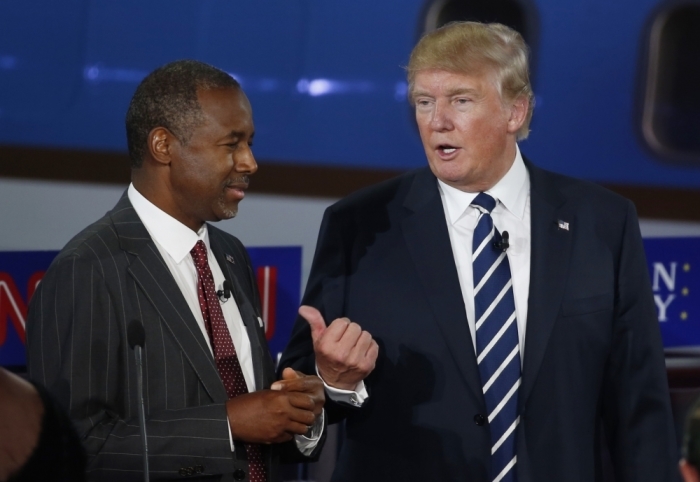 As different as Trump and Carson are, they're both real, and voters can sense it. They can also tell instantly, and generally dismiss, who's delivering rehearsed, focus-group-tested talking points," he added. Former Hewlett-Packard CEO Carly Fiorina who gave a strong showing in the debate has also dramatically improved her chances of being the GOP presidential nominee according to Rasmussen. Some 41 percent of voters now see her as the likely nominee while some 40 percent think former Florida Gov. Jeb Bush will be the likely nominee. "Bush's performance was once again a snooze until he went after Trump for bringing Bush's wife into the debate. Then he became authentic and energized," wrote Colvin. "A continuing problem is that he keeps talking about the importance of optimism, and it falls flat. He might heed some advice often given to writers: Don't tell me, show me. That is, don't talk about optimism. Be optimistic," he ended.